I got it for cheapcheap off ebay although I think anyone who buys a netbook for around 300 new must be at half braindead or at least a bit richer than me. 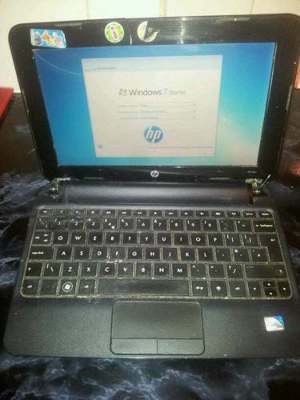 Faulty Hp mini netbook laptop. The left and right mouse key buttons don't work. Also the hinges are broken they are only being held on the one side by one screw. There has been glue spilt on the keyboard aswell. Also spring has broke on the on off switch you have to push it back to switch it on. Plastic around the screen is also broken nearly falling off. Apart from all that the rest works Wi-Fi screen speakers keyboard etc all working. I have done my best to describe to best knowledge as I can. 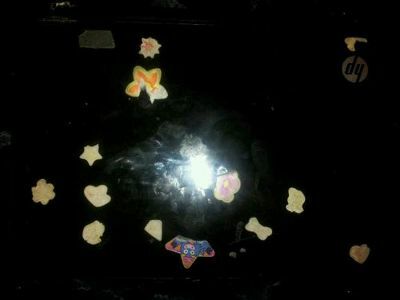 Laptop is still useable I was going to get it fixed but the place I took it said it would cost well over 100. The seller forgot to mention the sugary drink (coke?) spillage over the right side of the keyboard that made a few keys a bit hard to press. But the auction text already made clear it would be quite the mission so it's all the same to me. On the plus side, there's stickers all over it. and what can be nicer than a dash of silliness on one of those overly serious electronic devices? The places where art goes to die.